The CFO of a top ten global colocation provider is using Romonet to accurately calculate the exact profitability of every customer across its data center estate. This is achieved by analyzing the full cost of each customer's contracted capacity and actual power usage against their revenue. The same tools are used to provide per rack and per contracted kW costs to identify the current and projected profitability of its customers and data center capacity. The CFO uses Romonet's data to understand the underlying delivery cost for each customer, billing model and colocation space. The executive team can now use quantitative data on the wide range of delivery costs and margins to set minimum pricing thresholds for new customers and ensure financially sustainable contracts. 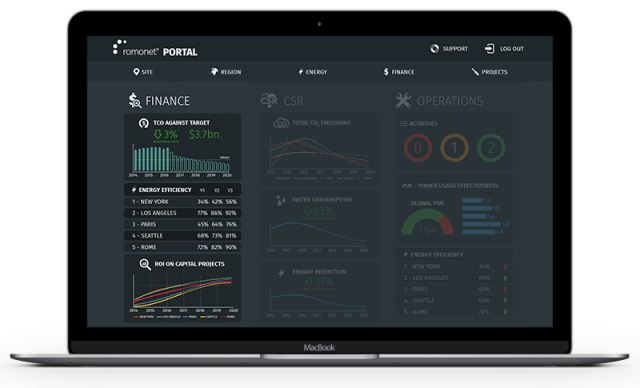 Furthermore, with Romonet’s cloud-based data center management platform, the CFO can monitor and predict which billing models and contracts are affected most by the many customer behaviors and fluctuating operational conditions that impact effective cost management. Romonet's capabilities have proved invaluable in a marketplace that is experiencing greater competition from cloud providers and falling service prices. The effect on colocation providers includes significantly reduced margins, increasingly challenging contract negotiations and the need to maximize each customer's monthly recurring revenue longterm. Zahl Limbuwala, CEO of Romonet, said, "The CFO's objective is clear – prove which customers are growing the business and which are costing money simply by being in the facility. Our data removes the guesswork associated with identifying how customer contracts are performing financially and where capacity is being occupied by low margin, and in many cases, negative margin customers. The CFO can understand the full cost of delivery for each data center at every level – for each operational region, IT hall, rack and customer." Prior to the existing relationship, Romonet started working with the colocation provider by designing a detailed, site-specific financial and engineering model to present the potential financial savings from a proposed chiller upgrade. Hundreds of data points proved that prospective new equipment and reconfiguration could deliver immediate, recurrent annual savings of $1.5M – a return on investment of under 12 months. Romonet's platform, the only data center management solution built on a native Big Data architecture, is patent-protected in Japan, China and most recently, the United Kingdom. The company's expertise is validated by its Garner 'Cool Vendor' status. Romonet partners with many global engineering firms to uncover the true total cost of ownership of the world’s largest and most complex data centers, colocation and cloud data environments.